Lisbon, the capital and the largest city of Portugal, is no longer an under-the-radar tourist destination. 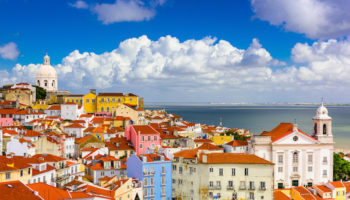 A city in Europe, Lisbon’s postcard-perfect cobbled streets, ancient structures, magnificent cathedrals, a majestic castle, red-tiled rooftops and an undiluted Portuguese culture makes it a beautiful destination for a 3 day getaway. One of the best ways to explore the city is on foot. However, for those who plan to use public transport, Viva Viagem and the Lisboa Card are tourist card options that can be taken advantage of. It is good to note that many tourist places in Lisbon allow free admission on Sundays and are most likely to be closed on Mondays. An extra (but highly useful) tip is to follow the signs stating “Miradouro” whenever you see them. 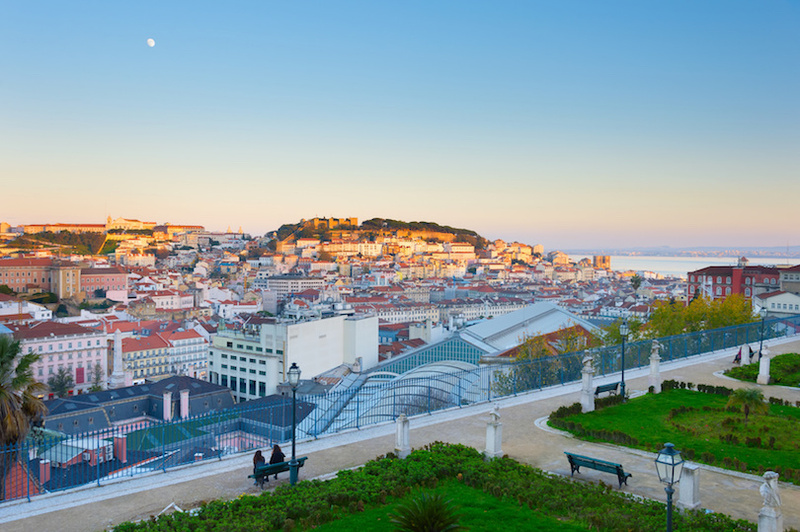 A Miradouro is a viewpoint and in Lisbon there are plenty of them offering spectacular panoramic views of the city and its river. Also, the city’s terrain is mostly hilly and cobbled so wearing comfortable flat shoes is recommended. 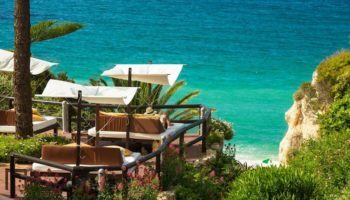 This 3 days in Lisbon itinerary covers all the bases and gives you the opportunity to see a mix of everything that the capital has to offer. 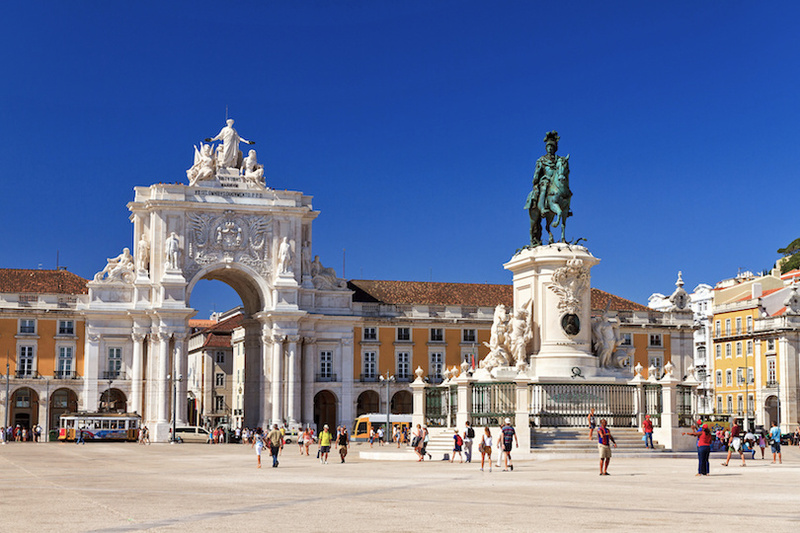 Your first day in Lisbon will involve plenty of walking so get ready for a busy yet rewarding day. There is no better way of starting your first day in Lisbon than grabbing a breakfast at the historic A Brasileira, in business since 1905. 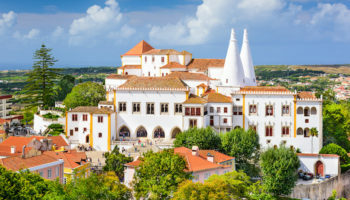 Feast on a pastel de nata (Portuguese egg tart) and a coffee as you appreciate the grand façade of Igreja dos Mártires, Basilica of Our Lady of the Martyrs. Why not continue the beginning of your trip with a bit of shopping? Since you’re in the area, you can’t miss a stroll through the shopping streets of Rua Garrett. From here, a gentle 5-7 minutes’ walk takes you to Praca do Comercio – the main square of Lisbon and your gateway to Lower Town a.k.a. Baixa. At its heart is the statuette of Dom Jose – Lisbon’s King during the devastating earthquake of 1755 and the subsequent resurrection of the city. Also, on the sightseeing radar is the mosaic-paved Praca Municipio – Lisbon’s City Hall and one of the most attractive structures in the city. Next, enter the area of Baixa via the colossal arch of Arco da Rua Augusta. 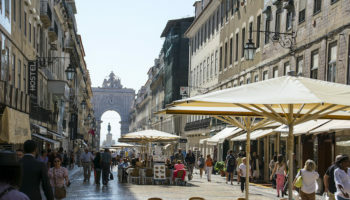 Beyond the arch is Rua Augusta – the main avenue of Baixa which offers more shopping options should you fancy it. Take a stroll around the cobbled streets or make your way to one of the iconic elevators of Lisbon – Elevador de Santa Justa. 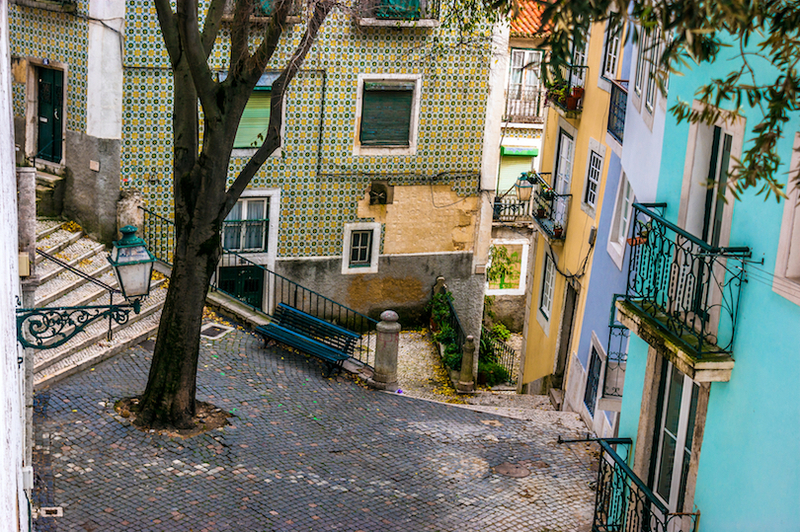 Climb up the narrow spiral staircase for even better views, take a few photos and enjoy a drink at the tower’s café before heading back down to the streets of Baixa. 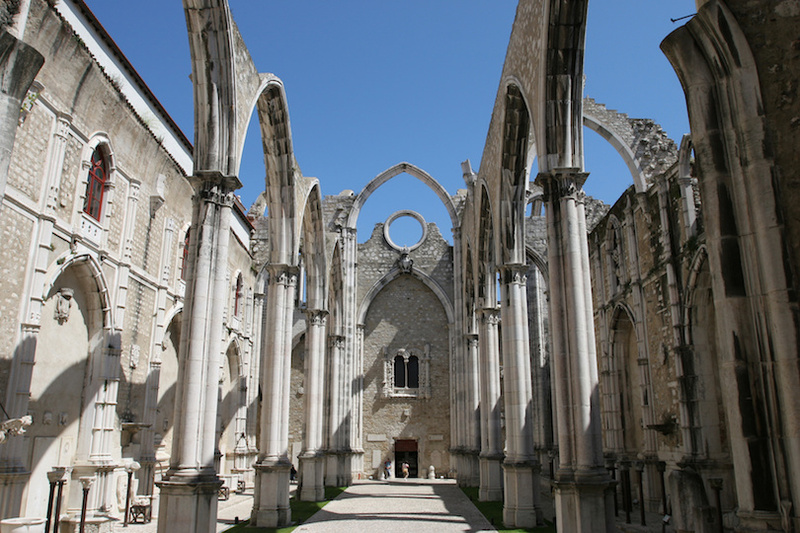 Start your afternoon visiting the Convento do Carmo – a beautiful 15th century Gothic monastery, partially destroyed in the earthquake. 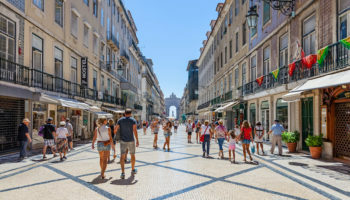 From here you can easily walk to Praca Dom Pedro IV (or Rossio), a large square in Baxia with a huge fountain, the impressive National Theatre, and plenty of cafes lining the perimeter. This is a perfect spot for grabbing a coffee or afternoon beer in the sun. You can’t leave Lisbon without tasting Portugal’s famous Cherry Liquer. You could try at any of the local bars but nearby A Ginghina is not only recommended but considered a landmark in the city. Go try some! From here, you could walk to Praca dos Restauradores – a square dotted with many stunning historical structures, cafés, and shopping avenues. A pleasant 10 minutes’ walk from Praca dos Restauradores brings you to the foot of Elevador da Gloria – another iconic elevator. The elevator was built in 1885 and takes you up a very steep hill to Miradouro de Sao Pedro de Alcantara – a stunning viewpoint that offers picturesque views of Lower Town and its castle (which you will visit tomorrow). 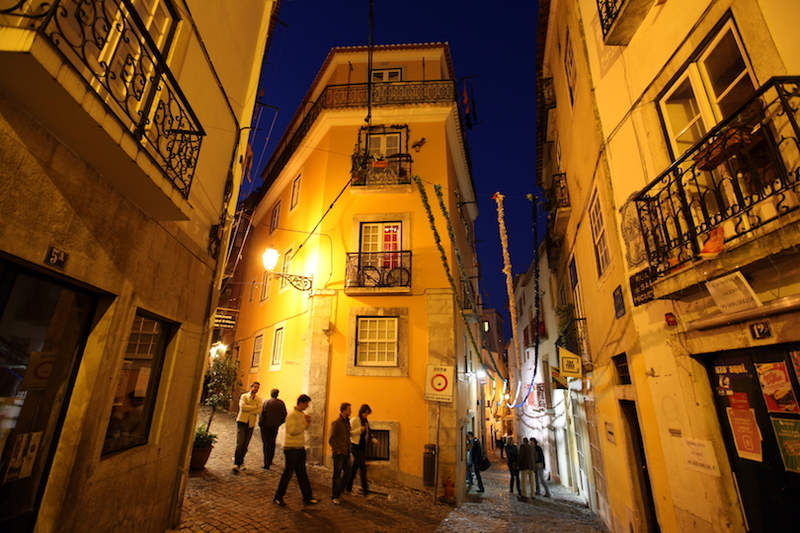 You are now in Bairro Alto, the most happening place in the city for nightlife. Enjoy a delightful Portuguese dinner and a glass of Portuguese port wine and then take a walk around the narrow streets until you find a cocktail bar that takes your fancy. There are plenty to choose from! Today, you will walk through the oldest part of the city and get onboard an historic tram ride you surely don’t want to pass on. Make your way to Baixa-Chiado Metro and hop on the historic Tram 28, a must do while in Lisbon. Get to the station as early as possible because the queue for Tram 28 seems to grow by the minute and each tram can fit only 30 passengers. Enjoy the ride as the tram ascends the hilly terrain of Graca with remarkable views of the city and its lesser known corners. Hop off at Largo da Graça and head towards Miradouro da Graca – another marvelous viewpoint with lovely views of Castelo de Sao Jorge. From the Miradouro, walk down towards the primitive village of Santa Cruz – a city inside a city, separated from the rest of Lisbon due to its altitude and the strong walls built by the Moors. The next stop is the São Jorge Castle – the most frequented tourist sight in Lisbon (buy advance tickets to skip the queue). Spend an hour inside the compound which offers more breathtaking views of Lisbon. Grab some lunch at one of the many eateries that line the street from São Jorge Castle to your next destination – Miradouro de Santa Luzia. 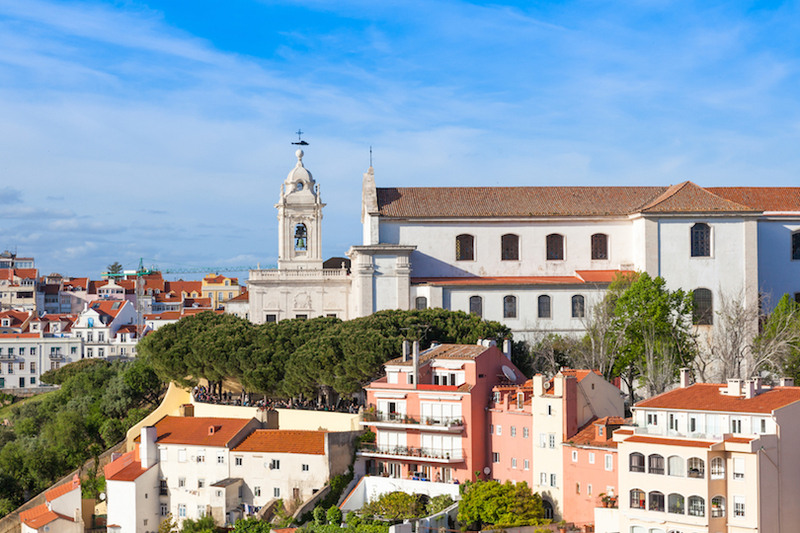 Check out the ancient church next to the viewpoint and enjoy great views of Alfama Old Town. Alfama is where Lisbon began and is characterized by a network of charming alleyways, cobbled streets, small squares and endless staircases. It’s as though Alfama has been frozen in time. While wandering through the maze of lanes, head over to Igreja de Sao Miguel – a Spanish-style basilica that dramatically stands out amidst the ancient structures of the Alfama district. Lisbon’s beautiful main cathedral is close by, simply known as Sé. Sé is free to enter and is well worth a visit to see it’s gorgeous interior. A short couple of minutes’ walk from the Cathedral is Pois Café, a recommended and popular spot for lunch and relaxation. Grab one of their many books on display and settle in for a while. 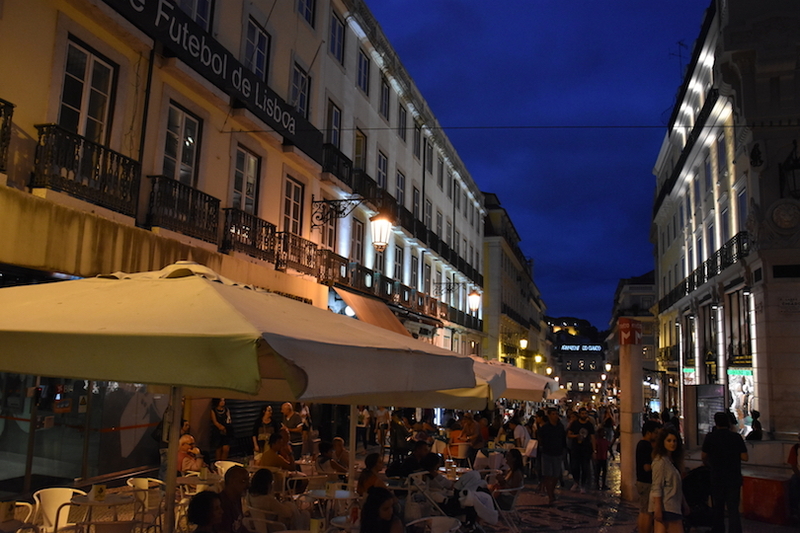 It’s worth staying in Alfama for the evening as the district is even more pretty once the sun goes down and the dimly lit lanterns begin to light up the streets. Alfama is also a great area to enjoy a romantic dinner. The narrow lanes are full of cosy restaurants cooking up local Portuguese dishes such as grilled sardines. Many of these eateries also offer live Fado musicians for an authentic Portuguese atmosphere. 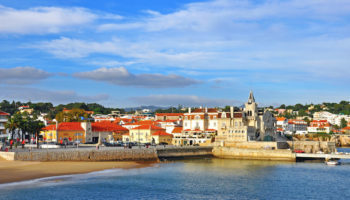 There are many small and hidden Fado restaurants to choose from but for something on a larger performance scale head to the popular venues of Páteo de Alfama or Clube de Fado. For your last day in the city, let’s take a slight detour away from Lisbon’s center to another historic district – Belém. 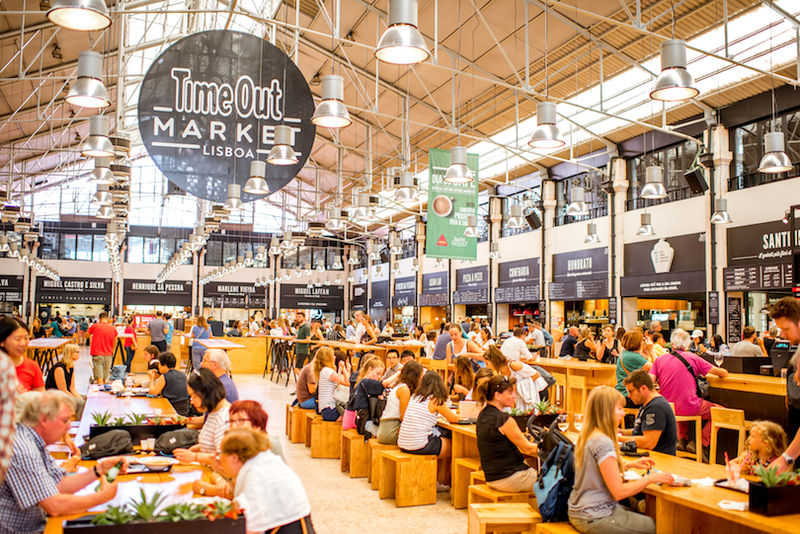 Start the first part of your last day in Lisbon with a light breakfast because soon after you should take a quick visit to the prominent Time-Out Market (opens 10:00AM). The market is a great place to buy some local snacks to either eat in the warehouse type eating area or take away with you to enjoy later in the day. Time-Out Market is also a great place to spend an evening with it staying open until 2AM on weekends. Across the marketplace is Cais do Sodre rail station from where you hop on the Tram #15 and make your way to the historic riverside district of Belém. Make your way to Mosteiro dos Jeronimos, a 16th century monastery commemorating Vasco de Gama’s epic voyage and also his final resting place. A few minutes walk is another landmark – Padrao dos Descobrimentos, constructed in honor of Prince Henry. From here, you can also catch a glimpse of the impressive Ponte de 25 Abril, a replica of the Golden Gate Bridge. 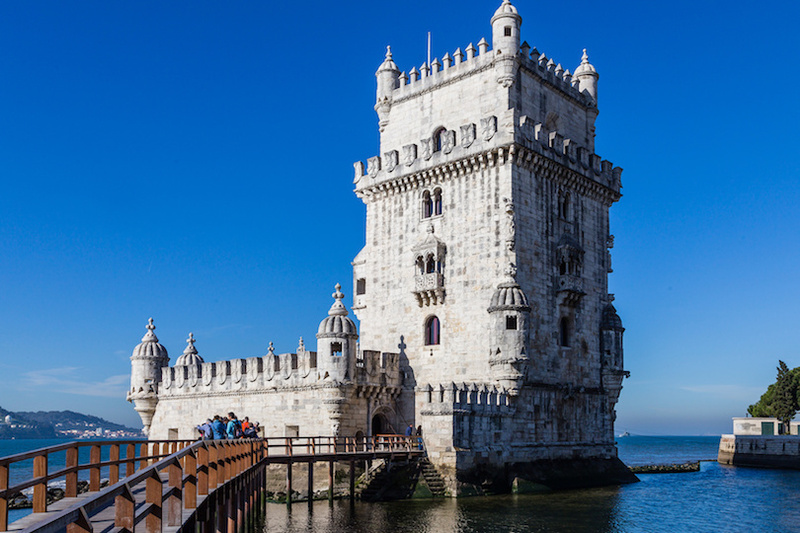 As the early afternoon arrives, stroll the pleasing riverside area towards Torre de Belem – a 16th century tower which acted as a fortress and a prison during rivalries. For lunch, Rua Vieira Portuense has streets filled with genuine Portuguese restaurants. Floresta de Belem is a good and inexpensive option. 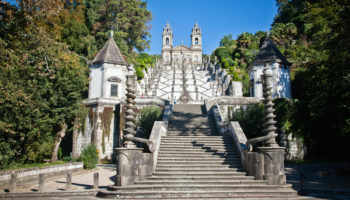 After lunch, take a 15-minute walk uphill to Jardim Botânico da Ajuda, also known as the Botanical Gardens of Ajuda. 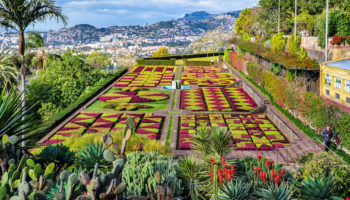 Established in the 18th century, the gardens house eight flawlessly manicured sections, collections of trees from all across the globe, and multiple fountains and terraces. The gardens offer a great chance to relax before you hop on the historic Tram #18 one more time. Get off Tram #18 in front of Mercado da Ribeira and take the Elevador da Bica to Bairro Alto. Walk 5 minutes to another scenic vantage point, Miradouro de Santa Catarina. 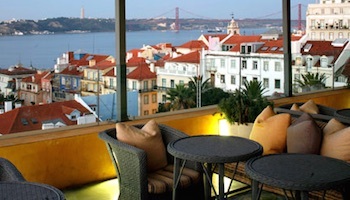 Embrace outstanding evening views of the city while enjoying a glass of fresh Sagres (local beer). Barrio Alto really is the best area to spend your evenings so we recommend hanging around here again for your last night in Lisbon. Try another restaurant and bar that you didn’t get to experience on your first night and if you’re young and energetic, head to one of the many nightclubs. Incógnito and A Capela are two extremely popular options. Or take our earlier recommendation of soaking up the evening atmosphere at Time Out Market (take a taxi). With plenty of bars and dining options there too it’s a great place to spend a night with locals and tourists. 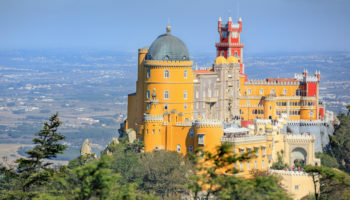 Thank you for writing a detailed and well thought 3 day itinerary for a trip to Lisbon. I plan to spend much more time here as I’ll be travelling from the USA this summer thanks to stridetravel who have helped me plan my trip with a great itinerary filled with some activities you mentioned in this article. Thanks for the great info and for the 3 day itinerary. We will be in Lisbon at the end of September so your info is very helpful.